The Final Word on Making a Change! Individual and Personal Change is one of the most interesting things that you can delve into. I’ve spent more time looking at why and how people change more so than any other aspect in my entire life. How do people change? Sometimes it’s good timing and a coincidence that shifts a person’s habit. They move and with that new environement start new actions, which lead to new habits. Why do people change? Sometimes people change because they’ve thought out an elaborate plan and act on it. Other times, people just start taking new actions. Either way, these questions form the foundation of a number of different topics. Over the years, despite all I’ve read about the traditional psychological theories on change, is that when it’s all said and done change comes down 11 Major Elements. Within those 11 Elements are 5 “Right Brain/Emotional” and mainly subconscious aspects which if you can envision a pyramid make the bottom 5 layers or the foundation of the Pyramid. The other 5 Elements are “Left Brain/Logical,” more conscious aspects which encompass the top 5 layers of the pyramid. The 11th Element is your overall neurological/brain functioning. I’ve dubbed these 11 Elements, the Pyramid of Change. Here’s an extremely crude look at it. Despite it’s crude look, this pyramid basically holds nearly any and all aspects that would come into play if you were to try and make a change. 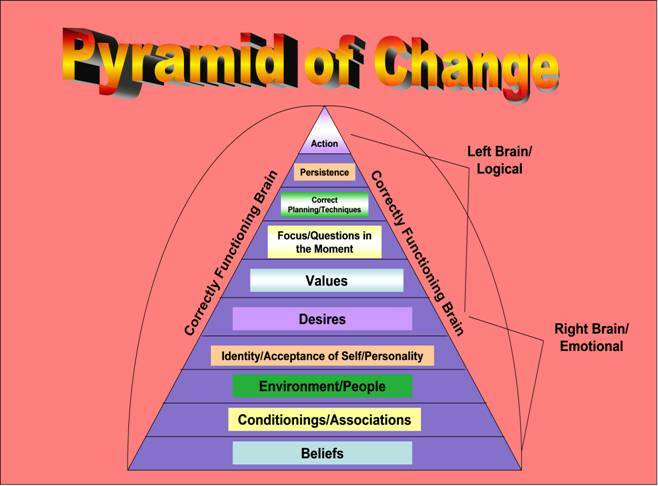 If you look at change, you can use any and all aspects of this pyramid to create a change. For example, from the bottom up, you have the most propensity to make a long-lasting change. If you change your beliefs, you have a strong ability to change your conditionings. Change your conditionings and associations and your environment doesn’t keep you trapped and you are more likely to move up the pyramid and change the people you spend your time with. Change your beliefs and associations and you have the ability to start to accept your self. Accept yourself and you may start to actually act on those desires that you’ve had for years but haven’t acted on. By acting on your desires, you start to match your values with your true desires. By valuing new and “authentic” things about yourself, you start to change your focus. By changing your focus and with a renewed desire, you start to seek out the best information to get you to where you want to go. With that, you decide that no matter what happens you will do what it takes (take a mindset of persistence) and take the requisite actions. Although, I think changing from the bottom up will leave you with your most authentic self, will leave you striving for those things that are true to your inner-most self, you can also see changes from the top down. For example, if you start to take new actions, you can effect change and gain momentum, therefore, effecting persistence. With that persistence, you can then move down and seek out the best ways to achieve a goal. With those correct techniques in place, you can then change your focus. Your change in focus affects your attitude about the situation, which then goes on to effect your priorities or what you “Value.” If you change what you “Value” then you inherently change your desires. With a strong enough desire, you can start to add to your Identity. If you change or add to your Identity and what you identify with, you will almost certainly change either the environment that you are in and the people that you seek out and associate with. Change that and you have the ability to start and change past conditionings and associations. With those changes, you have the ability to expand your thought process and what you believe. The problem I have with starting from the top down is that you leave too much of it to external and variable factors that may or may not be true to what you actually desire (Knowing what we truly want though is a whole different topic – Cognitive Dissonance anyone?). With that said, you can also start within any layer of the pyramid. The problem with starting in the middle, and really with most regular “self-help” books is that they ONLY focus on that one aspect. And if that ONE thing is what is hindering you, then you have the ability to see positive changes. If it’s not though, you think that you’re a “failure” for not seeing positive changes, when in fact it’s insufficient data for you to change. The only other aspect of all this change is how well your brain functions. For example, if you drink a lot of alcohol, then you may have effected how your brain functions. Another example, and one that might hit more at home for you, is if you have a “sweet tooth” and take acetamiinophen (Tylenol) regularly. The sugar, especially if mixed in with other flavorings can disrupt normal brain functioning, skew your neurotransmitters so you make less dopamine, shift your hormonal functioning and lead to vitamin and mineral deficincies which can causes anxiety and mood disorders. The acetaminophen will reduce your body’s glutathione levels which is your body’s main anti-oxidant and helps to fight against toxins, inflammation and free radicals. These common foods and medicine will change your brain’s ability to function correctly, may effect your energy levels and ability to deal with stress. Without a correctly functioning brain, you will be fighting an uphill battle no matter any other action patterns you take on. Therefore a correctly functioning brain effects everything from action and persistence to your beliefs and conditionings. 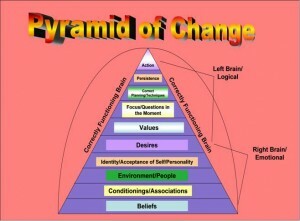 With that said, the next time you try to take on a change, look at the pyramid and see what steps you need to take. Notice your weak points and start with changing those things first. When you do, you’ll see the ripple effect of that change process and how it effects everything in your life, from top to bottom. 7 – Focus in the Moment: Do You Lack Self-Control? 8 – Correct Planning: Having Problems Sticking to a New Habit? 9 – Persistence: One Step at a Time and a video in What are You Going to do when you Fall? *I’m currently reading the UltraMind Solution by Dr. Mark Hyman and will have a post up about the “correctly functioning brain” within the next couple of weeks. Again, if you have any questions or comments, please feel free to leave a comment below. I know when I changed it was due to something emotional that happened. Almost anything can push you to change, then you just have to stick to it! Emotional Reasons for change are definitely huge and in the Free 16-page report I give away, it’s the first thing that I have you work on. Basically finding that emotional reason which propels you to take an action is essential in giving you the motivation to make the change you want.